It's hard to pigeonhole Alan Bennett, and correspondingly easy to undervalue his achievements. Although one of the most recognisable writers of his generation, his unassumingly owlish persona and fondness for self-deprecation has created the impression of a lovably eccentric minor talent, whose amusingly droll plays about elderly Northern women (typically played by Thora Hird ) and fusspot secretaries ( Patricia Routledge ) are merely one step up from sitcom. The idea that he might be the most important and innovative British television playwright since Dennis Potter initially seems laughable. But it's hard to think of a stronger contender. His prolific output includes individual television plays, television series and cinema films, together with numerous stage works, short stories, assorted journalism and his inimitable diaries. An Englishman Abroad (BBC, tx. 29/11/1983) and the two Talking Heads series (BBC, 1988/98), are regularly cited amongst British television's greatest achievements, and he is widely recognised as the master of the television monologue. Furthermore, his work is generally darker, harsher and more satirically barbed than his (deeply resented) 'national treasure' status and peerless ear for the eccentricities of Yorkshire dialect and workplace gossip would suggest. Often, what looks like endearing shyness is closer to full-blown paranoia (Kafka is a character in two plays, and his shadow looms over several more), with family life either fractious or awkwardly silent, his elderly characters often facing a lonely, neglected death. His ability to get under the skin of such withdrawn people and write about them with such empathy, compassion and wry (often gallows) humour makes him not just a great writer but the definitive chronicler of a certain kind of English ordinariness, whose outwardly placid surface conceals inner turmoil as intense as anything displayed by the more emotionally articulate. Born on 9 May 1934 in Armley, Leeds, the son of a butcher, Bennett grew up surrounded by gossiping Yorkshirewomen, which made an indelible impression on him, as did regular holidays to coastal resorts like Morecambe. His first encounter with comedy was via the radio, but he later said that he disliked popular comedians like Tommy Handley and Tommy Trinder for being 'relentlessly cheerful': more down-to-earth figures like ITMA's appropriately-named charlady Mona Lott were closer to an already melancholic outlook. Winning an Oxford scholarship, he spent the 1950s preparing to become a medieval historian, until his increasing fondness for the stage culminated in a legendary collaboration with Peter Cook , Dudley Moore and Jonathan Miller . Almost single-handedly, Beyond the Fringe (1960) revolutionised British satire, moving it from Goonish surrealism towards pointed, often controversial political comment. Post-Fringe, Bennett contributed to BBC sketch shows Not So Much A Programme, More A Way Of Life (1964-65) and BBC-3 (1965-66) and played the Dormouse in Jonathan Miller's imaginative adaptation of Alice in Wonderland (BBC, tx. 28/12/1966), before writing the sketch show On the Margin (BBC, 1966). His first small-screen play, A Day Out , was filmed by Stephen Frears (BBC, tx. 24/12/1972), who would direct and/or produce the majority of Bennett's television work over the next decade. It and Sunset Across the Bay (BBC, tx. 20/2/1975) were wistful, elegiac pieces, with Bennett drawing on his Yorkshire roots for the first time in his portraits of, respectively, a Halifax cycling club in 1911 and an elderly couple (based on his parents) retiring to Morecambe but feeling desperately homesick for Leeds. 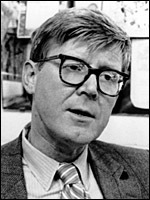 His television breakthrough was with the LWT series of Six Plays by Alan Bennett (1979). Although he would publish five of these scripts under the title The Writer in Disguise, there was little overt autobiography, but much delving into recurring preoccupations, be they shyness and loneliness ( Me! I'm Afraid of Virginia Woolf , Afternoon Off ), office minutiae ( Doris and Doreen , One Fine Day ), the limited appeal of Northern seaside towns ( Afternoon Off , All Day on the Sands ), family alienation (Me! I'm Afraid of Virginia Woolf, One Fine Day, All Day on the Sands) and a foreboding sense of impending doom (Doris and Doreen, The Old Crowd ). The play that garnered most attention, much of it strongly negative, was The Old Crowd, an unusually experimental piece for mainstream British television, though much of its confrontational style came from director and uncredited co-writer Lindsay Anderson . Bennett returned to the BBC for his second cycle of plays, given the unofficial collective title Objects of Affection (1982). These showed a deepening concern for the lives of ordinary people, whether the dying fathers in Intensive Care and Rolling Home , the slow-witted Our Winnie , the unemployed teenager and his mother in Marks , or the elderly couple and naïve social worker in Say Something Happened . As before, one piece stood out for stylistic innovation, the monologue A Woman of No Importance , with Patricia Routledge inaugurating what may be Bennett's most lasting television monument. The mid-1980s saw several one-off scripts, often about real-life figures such as Guy Burgess ( An Englishman Abroad , BBC, tx. 29/11/1983), Franz Kafka ( The Insurance Man , BBC, tx. 23/2/1986) and Joe Orton ( Prick Up Your Ears , d. Stephen Frears, 1987). The last of these was Bennett's second cinema screenplay: his first, A Private Function (d. Malcolm Mowbray, 1984) revisited the postwar Yorkshire of his boyhood in a story of food rationing and unlicensed pig smuggling. But it was Talking Heads (BBC, 1988) which lifted Bennett's television writing onto a higher plane. The title was inspired by the adage that "talking heads" made bad television, but Thora Hird , Maggie Smith , Stephanie Cole , Julie Walters , Patricia Routledge and Bennett himself comprehensively countered it, painting unforgettable portraits of damaged lives and thwarted expectations. It took less than a decade for them to appear on the A-level syllabus, cementing their modern classic status. A second, equally acclaimed series followed in 1998. A few months after the first Talking Heads series, the BBC broadcast Dinner at Noon (tx. 8/8/1988), a documentary that was Bennett's most autobiographical piece to date. Although wary of the media (fuelled by horror at the way the tabloids hounded his friend Russell Harty as he lay dying in hospital), he would gradually reveal more personal information via carefully-selected diary extracts, published first in the London Review of Books and then collated in the surprise best-seller Writing Home (1994). He also made a reflection on art and portraiture ( Portrait or Bust , BBC, tx. 4/4/1994), a personal tribute to Westminster Abbey ( The Abbey , BBC, tx. 1995) and two series of short television monologues, Telling Tales (BBC, 2000) and Bennett on Bennett (2009), which collectively offered the most vivid reminiscences of his childhood and parents to date. Bennett's previously prolific output slowed noticeably in the late 1990s and early 2000s. He initially complained that he had been suffering from writer's block before finally admitting that he had undergone treatment for cancer in 1997. This was revealed in his 2005 collection of confessional essays, Untold Stories originally written in the expectation that they would appear posthumously: they also dealt frankly with his homosexuality, a family history of mental illness, and his motives for refusing a knighthood. Throughout his career, Bennett also wrote extensively for the stage, his greatest success being The Madness of George III (1992). Bennett himself adapted it for the cinema, and, scenting its American backers' preference for a major star, made it a contractual condition that both original star Nigel Hawthorne and director Nicholas Hytner be retained. The slightly retitled The Madness of King George (1994) was a critical and commercial triumph, with Hawthorne and Bennett receiving Oscar nominations. Of the later plays, The History Boys (2004) was subsequently filmed, again by Hytner (2006).